Pros: Excellent and tenacious performances from this two-person cast. Cons: For me some of the musical numbers needed a little more development. A charmingly staged and well performed first project for new musical theatre innovators, Spatfeather. The Liberation of Colette Simple is an adaptation of an early Tennessee Williams’ play called The Case of the Crushed Petunia’s. Developed by a collaboration of 8 playwrights and lyricists from differing theatrical backgrounds, it tells the story of Colette: a woman living a simple and staid life in a small town. She religiously tends to her prized petunias with only a canary for company. 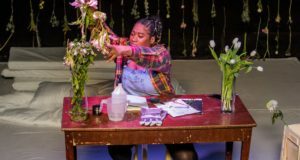 One day she discovers that her flowers have been utterly razed to the ground which, with the help of a curious stranger, forces a revelation about her life. The piece is the first project of new company, Spatfeather. 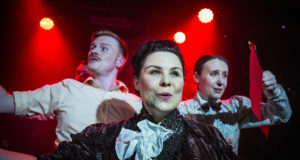 Self-proclaimed ‘collaborators extraordinaire’ the company have a vision of reinventing musical story telling by creating a new hybrid of the immediate excitement of cabaret with the narrative force of music theatre. Thus this piece combines musical theatre with sinister and absurb comedy. The staging takes a lot of the epic style: with one of the two actors (the one not playing Colette) providing the whole kaleidoscope of characters in Colette’s life. This doesn’t equate to more than about four people, but does include a pretty terrifying and outspoken canary. For this the actor dons a token yellow plastic beak, and perches scornfully on a large swing on stage. The main message of the play is touching, still relatable to new audiences, and lends itself perfectly to musical theatre. One recognises the mark of Tennessee Williams, who as a playwright often explored the lives of characters on the brink. Colette has paralysed herself. She is on the virge of a meltdown. She hates her world, but in order to deny the notion of something else she remains tightly wound within it. When she finally lets go of the illusion the results are extreme. Both Nathalie Carrington and Gary Tushaw are excellent. ; their energy is palpable. There are also some very funny moments. Running just over an hour it is pitched pretty well too as some musicals do have a tendency to run rather long. However, I wasn’t completely carried away. I suppose, like all things, musical theatre is a matter of personal taste. I love a good musical. For me musical theatre is to the theatre world what poetry is to the world of literature. In that it has the power to channel extreme emotion in a short space of time and in a beautiful way. Obviously as I said, and no doubt as Spatfeather recognise, The Liberation of Colette Simple fits this profile. 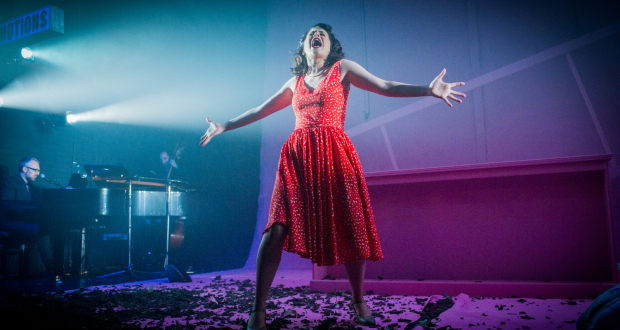 Colette’s explosive revelations certainly demonstrated extreme emotion. However, the story is just as much about stillness. About real contemplation and acceptance of one’s state of mind as it is about summoning the frenetic determined energy to change. And for me there wasn’t really a musical number that was beautiful enough to convey the more contemplative aspects of the piece. The one song which could have, I felt was lacking something. 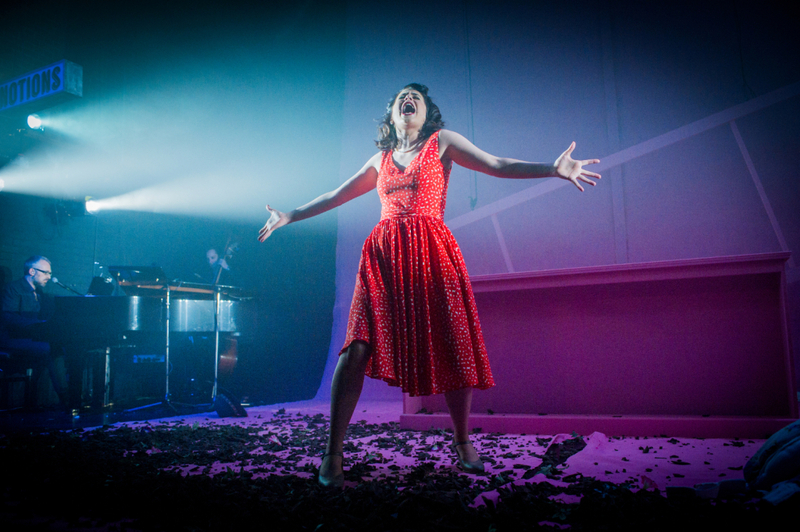 The others songs – and especially the final one – were very good though, especially for a newly devised piece. Another small caveat was that I couldn’t always hear what the actors were singing over the sound of the band. To be fair I was sitting right near the band at the front of the auditorium but not being able to hear did make my mind wander a little at times. Overall this was a charmingly staged and well-performed first project for musical theatre innovators Spatfeather. I am definitely looking forward to their next project. Works in the heritage sector. Jenny lives in London and is lucky enough to work in a Museum (she thinks its lucky but appreciates not everyone would) She loves theatre but never had the talent or determination to get involved in any serious way. As a result she spends a lot of her time kicking around various auditoriums and fringe theatre bars in a vain attempt to be down with the cool theatre kids. Any kind of theatre will do, but especially anything remotely Brechtian.